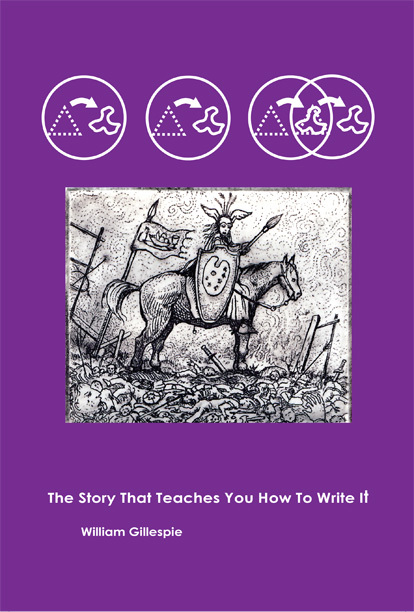 The Story That Teaches You How To Write It is a simultaneous story and essay. The story (on the verso (left) pages) is about graduate students in love. The essay (on the recto (right) pages) is about the structure of the story opposite, describing the techniques used in composing each section. Both take as a starting point Roland Barthes's S/Z and structuralist narratology. The book is primarily a reference for innovative fiction writers: experimental fiction that makes it clear what the experiments actually are. The purpose is to turn literary criticism back into literature by showing how analyses of novels might point the way to new forms. Unlike science, experiments in art strive for irreproducible results, so the methods deployed here can be used to compose entirely different sorts of work. George Lakoff's theory of metaphor is used to design characters, and music composition is used as a way to understand writing. The story was handed out in a graduate writing workshop led by David Foster Wallace, and student comments appear in footnotes, providing an additional layer of interpretation, as well as a commentary on the workshop experience itself. 6 x 9 inches, perfect bound, 80 pages. ISBN 0-9724244-0-7. $10. Cover art by Scott Westgard.